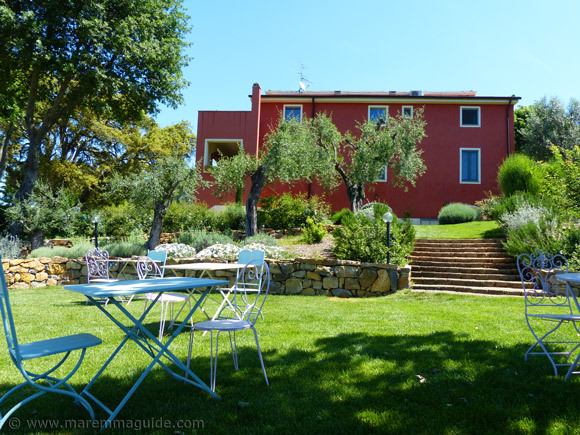 Simply put, one of the best places to stay in Maremma. 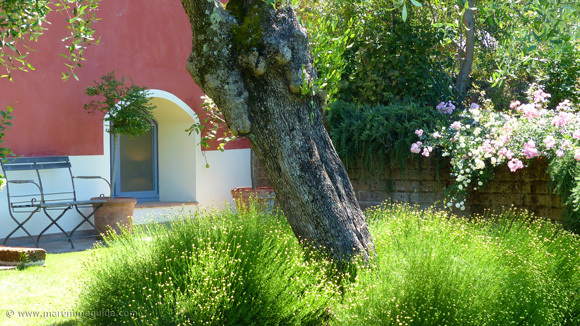 The Il Giardino dei Sugheri B&B - "Giardino dei Sugheri" means garden of cork oaks - belongs to husband and wife Michele and Cristina who, over the last seven years, have restored an ancient Tuscany farmhouse into a wonderful, quality bed and breakfast accommodation. 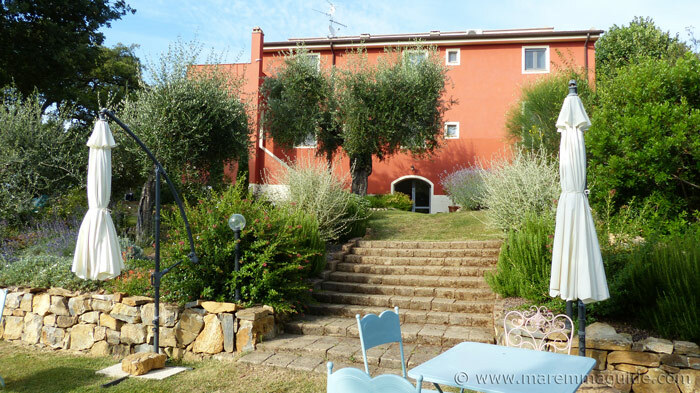 And, one year at a time, have transformed the macchia that had grown right up to its front door into an immaculate perfumed garden. 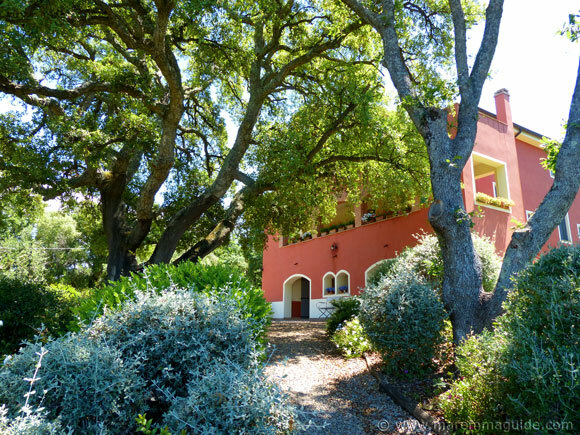 Today the grand old oak trees provide the shade for their guests and the running of the B&B is a family affair. With their parents helping in the background with the garden and the swimming pool. 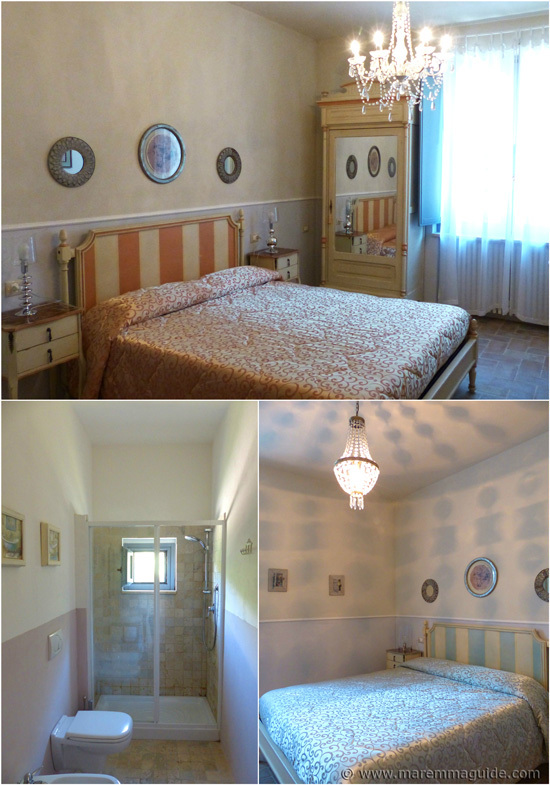 The bedrooms are fresh and filled with light. Decorated in pastel shades with hand-painted furniture and a touch of femininity that adds a lovely softness and romantic air to each one. I love Cristina's style: the duck-egg blue of the window frames, the opaque cream backdrops with subtle touches of greens and violet and orange, a few well-chosen accessories and a chandelier here and there. 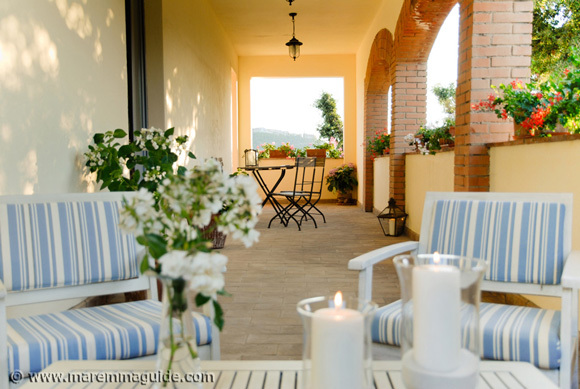 All set off perfectly by traditional Tuscan terracotta tiled floors, piles of soft white towels and marble in the bathrooms. There is a TV in each bedroom along with free wi-fi. The upstairs twin rooms - two double bedrooms each with their own en-suite bathroom - is ideal for a family or two couples travelling together. The B&B does cater for pets, but only in one of the bedrooms: in one on the ground floor that has its own arched entrance and covered terrace opening directly onto the garden. It is a large room - with plenty of space for your dog or cat to stretch out too, so you won't be falling over each other's feet. 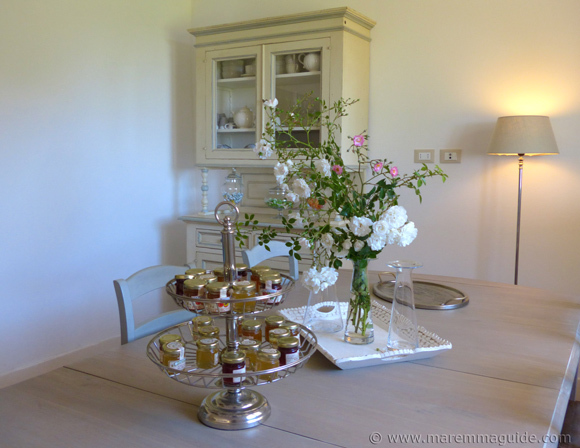 An Italian breakfast of local produce is served in the garden, but if it is raining or too cool then you will find the table laid in the spacious dining room. Which is where you can also eat any snacks, lunch or dinner you might want to prepare for yourself. As hosts go, you couldn't ask for a more attentive yet completely discreet couple: readily available whilst serving you breakfast to answer any questions you may have and help you plan your day out etc, yet at one and the same time melting in the background so that you feel like you are sat in your own garden. A famous movie star would be just as much at home here as you or me! 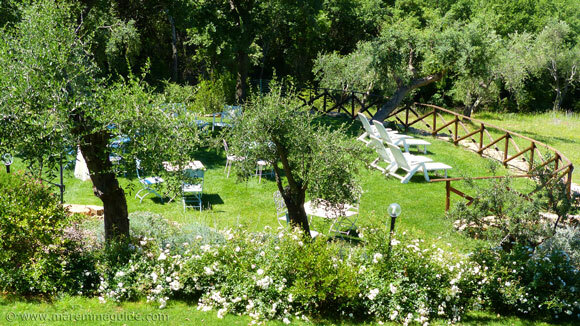 The barbecue in the garden is another relaxed lunch or dinner option: rustle-up a fresh salad in the kitchen, lay one of the pretty tables in the garden, open that all important bottle of local wine that you picked-up whilst visiting the winery next door, and throw a Tuscan steak on the grill above the red hot wood embers... A fabulous dinner in a stunning setting in under 10 minutes and no need to drive anywhere, so that bottle can be finished as the night unfolds and the stars come out. And, oh boy, is there some star gazing to be had here immersed in Mediterranean macchia with no city light haze. If you happen to be in Maremma in mid-August (you will need to check the meteorological forecast for the exact dates each year) for the "notte delle stelle cadenti" - the nights of falling stars, also known as the "Lacrime di San Lorenzo" - the tears of Saint Lorenzo - you couldn't wish for a better location than the garden of this Maremma B&B. If you are lucky and the peak of the meteor shower is on a clear night, laying on the lawn you will be treated to a magical display of around 80 to 90 meteors in an hour. 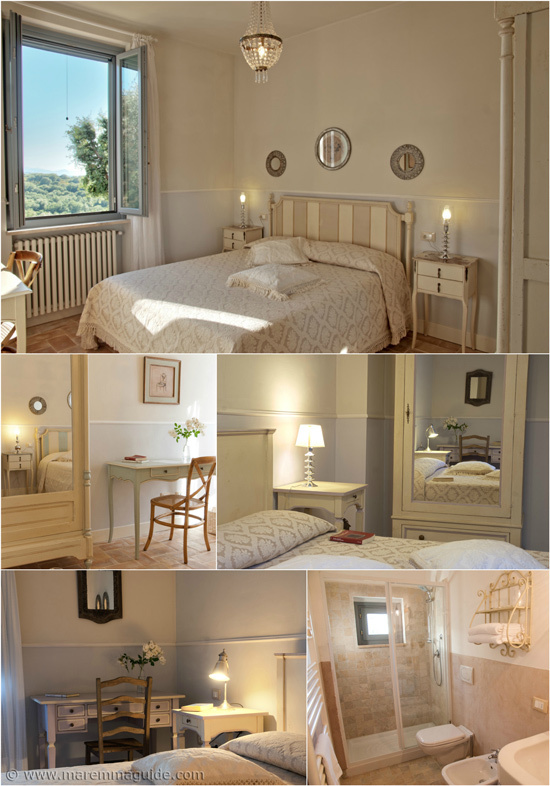 Which brings me to why I chose to describe this lovely Maremma bed and breakfast as "of castles and fairies". 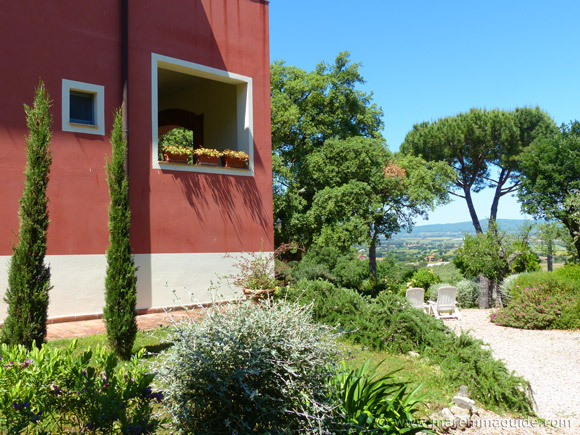 The first reason is because one of the views from this garden of cork oaks is of the stunning "Castello di Scarlino", the castle of Scarlino. 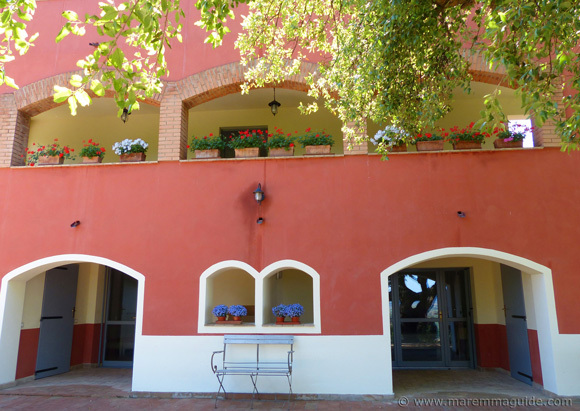 Michele and Cristina wanted to chose a colour for the external walls of the old farmhouse that would fit both its character and location deep within thick Mediterranean macchia, and reflect the warmth of hospitality that they wished to offer their guests. They chose the colour of the trunk of the cork oaks in the garden after the cork has been stripped and I love it. 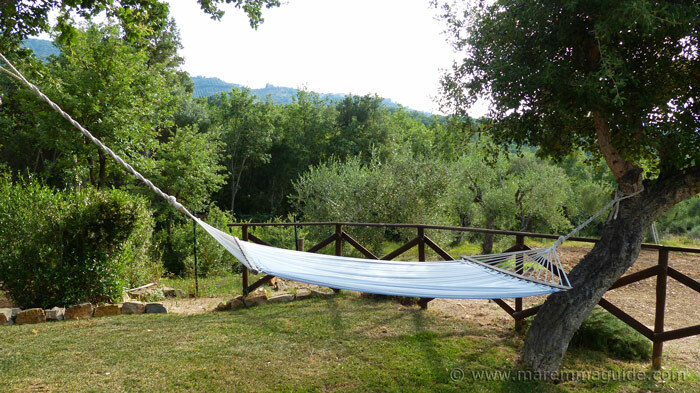 But it is when the sun goes down over this Maremma bed and breakfast that another magical thing happens. For, although the lawn has its own garden lights, sometimes it doesn't need them for mother nature brings her own in the summer: fairies carrying tiny lanterns that light-up the petals of the roses and the blades of grass. Take a step closer to see and the lanterns go out, only to come on again in another place. Your children and the child in you will love this experience. The night lights of the fireflies usually arrive in July, but this year at the Giardino dei Sugheri they were already there in May: they must cherish this place like I do. 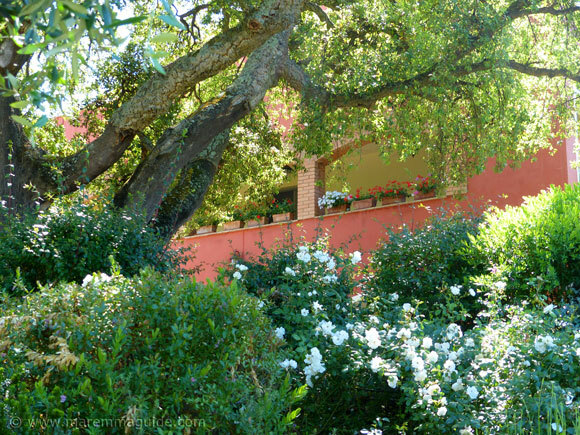 The garden is a love affair between old English roses, lavender, Mediterranean herbs, olive trees and ancient oaks. 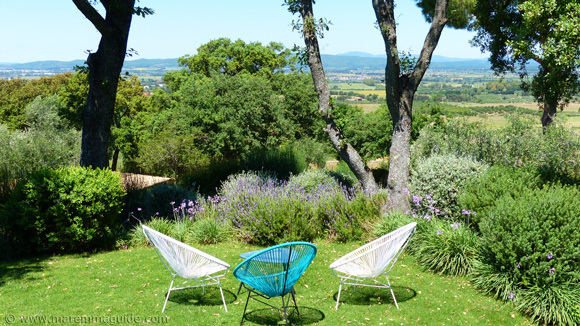 If ever there was a garden to linger in, then this is one. Which is probably why Michele and Cristina's guests are never in a hurry to leave. 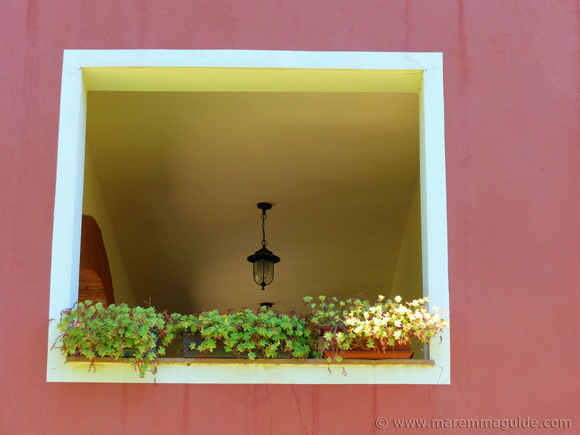 Even with a full day of exploring Maremma ahead of them, or when it becomes time to move on to their next destination. I have watched them reluctantly drive down the hill after breakfast when it is well approaching mid-day! The whole garden is enclosed by fencing, with access to the property being through the locked gates to the parking area beneath the old oak tree. 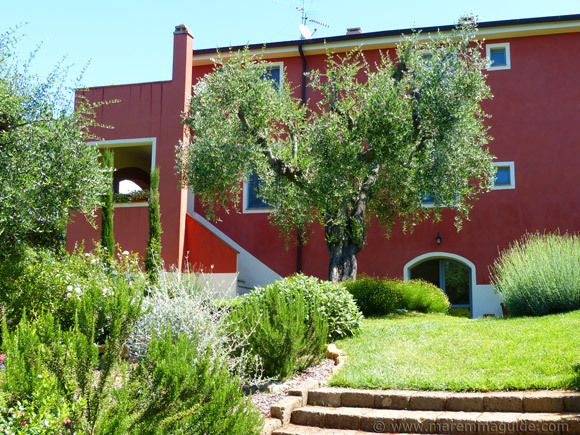 Which means that if you have young children with you, you can safely let them wander around without the worry of them wandering down the lane or into the Mediterranean macchia below the garden. 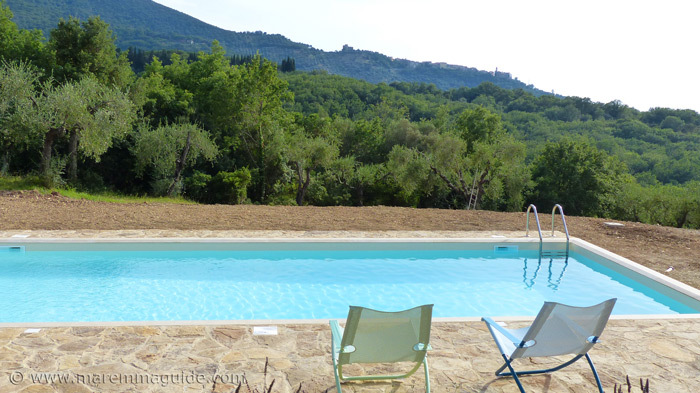 The swimming pool in the garden - on the level below the lawn - was completed at the end of June this year. The ground had been prepared for a long, long time, but the necessary permissions took a long time coming "in the post"! Six years in fact! Official things take a lot of time here in Italy. And, like the rest of the garden, has lavender around it. With more to be planted in the autumn when the heat of the summer has passed. The arched terrace is a perfect place to sip an early evening aperitivo or a before bed mug of hot chocolate and read a book. The old-fashioned paper and hardback versions of the latter you will find in your room and in the dining room for you to choose from, to swap with one of your own if you want to. Couples on a romantic weekend. 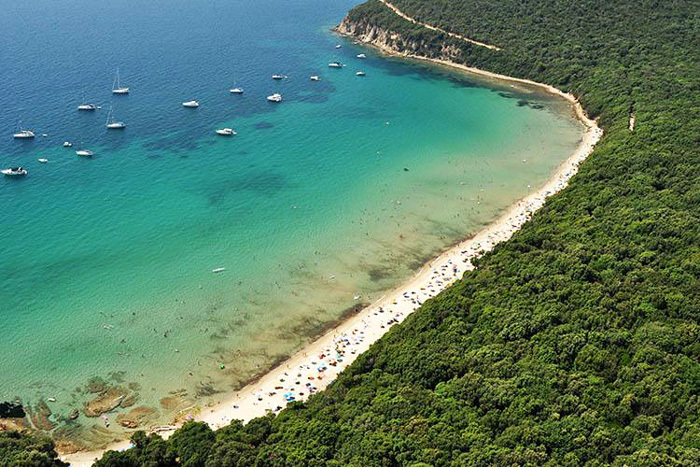 Visit the nearby most beautiful beach in the whole of Italy: the white sand cove of Cala Violina that sings violin notes as you walk along its sands. 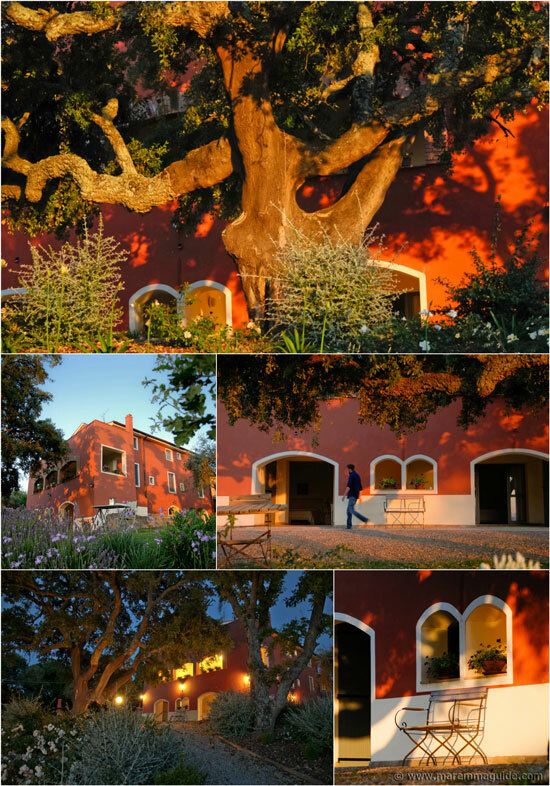 Drive up to the spectacular medieval and Renaissance hill town of Massa Marittima for dinner and watch the sun set over the Island of Elba and the wooded metalliferous hills. Couples with young babes. Mum's, the kitchen is off the garden so that you can prepare your little ones their milk or food close by and take it straight into the garden. There are lots of lawn areas with sunny and shady spots in which to lay down a cover and let them safely crawl around. Friends travelling together. 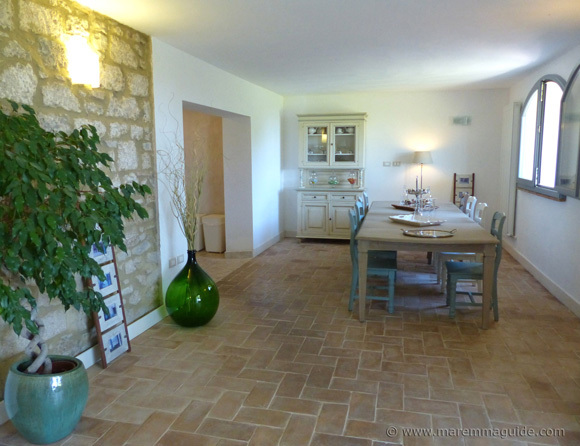 You could find yourself having the old farmhouse all to yourselves. But just as the pure tranquility is perfect for many, it can be too quiet for some. Michele told me that one of his city couple visitors told him it was too quiet! They weren't used to the complete silence broken only by bird song and crickets! So if you have teenagers, you will need to think of how to keep them amused when they have finished playing their video games and fairy tales don't cut the muster any more! 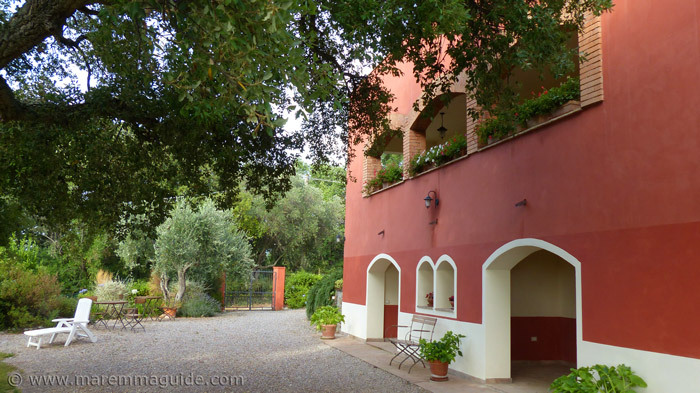 Just a short drive away, down the hill on which the bed and breakfast sits and up the one on which you will find the small Tuscan town of Scarlino, is the castle. I have to tell you that the views from its grounds are nothing short of stupendous and if you visit during the summer you might even find me sat there typing, because the summer chalet bar there is one of my very favourite haunts. 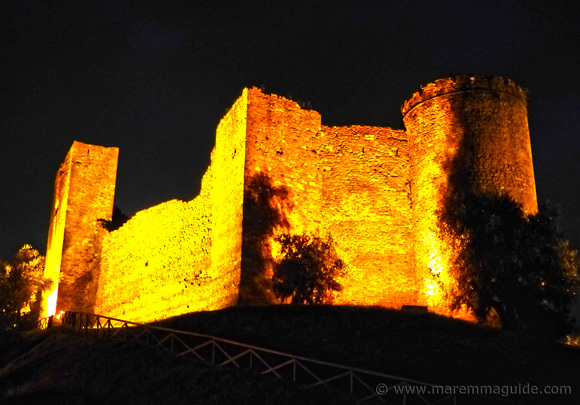 The castle is lit-up at night and makes for a perfect romantic pre or after dinner stroll. 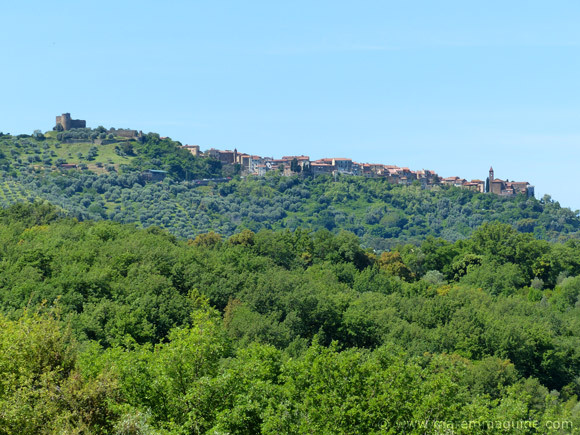 Find out more about this medieval castle on the hill and the 100 solid gold coins found hidden in its church walls - the Castello di Scarlino. 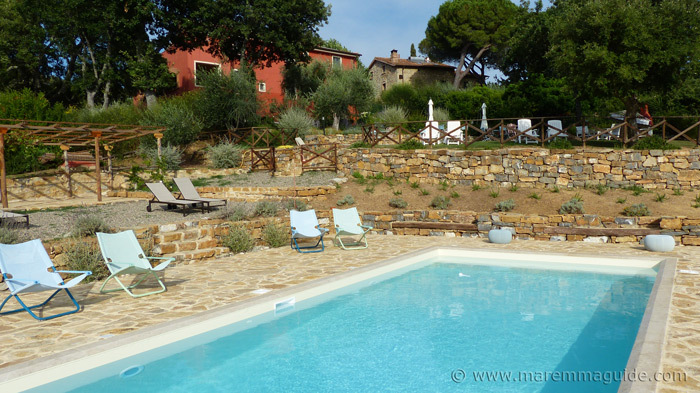 Check on availability with guaranteed best prices and free cancellation.